An artist's concept of a solar storm breaking through the Earth's magnetic field. For the first time, scientists have pinpointed where an Earthbound space storm would strike when it crashed into the atmosphere, helping give advance warning of its arrival. These findings suggest researchers could soon help give better and better forecasts as to when these solar storms might wreak havoc on spacecraft and on Earth. 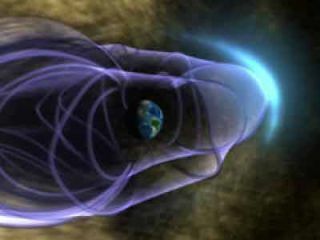 The energy for space storms originates from the solar wind. They can force the Earth's magnetic field to suddenly and dramatically release as much as 50 gigawatts of power into the atmosphere, roughly equal to the output of 10 of the world's largest power stations. "We see the benevolent side of space storms in the form of the Northern Lights," said researcher Ian Mann, a physicist at the University of Alberta in Canada. "When electrically charged particles speed toward Earth and buffet the atmosphere, the result is often a dancing, shimmering light over the polar region." But space storms have a dark side as well. The high-energy particles they release can fry spacecraft, and the electrical currents these particles carry can damage power grids on the surface and disrupt radio communications and satellite navigation. To investigate these tempests, the researchers studied magnetic disturbances as one space storm crashed into the atmosphere in 2007, using ground-based observatories spread across northern Canada and the five satellites of NASA's THEMIS mission. By analyzing these magnetic tremors, the researchers followed these waves backwards and succeeded in predicting the point where that storm impacted the upper atmosphere about 60 miles (100 km) above the Earth's surface. They spotted magnetic ripples zipping away from above Saniki luaq in Nunavut, Canada, "at speeds on the order of 60,000 mph, much like the blast wave from a gigantic explosion," said researcher David Sibeck, project scientist for NASA's THEMIS mission. "We were delighted to be able to do a short term forecast of where this space storm would impact, about two or three minutes of advance warning," researcher Jonathan Rae, a physicist at the University of Alberta, told SPACE.com. "If we can better understand the physics of space storms as we hope to, down the road we hope to move into forecasting these storms even more ahead in time, perhaps a number of hours." Mann, Rae, Sibeck and their colleagues detailed their findings on May 25 at the American Geophysical Union meeting in Toronto.